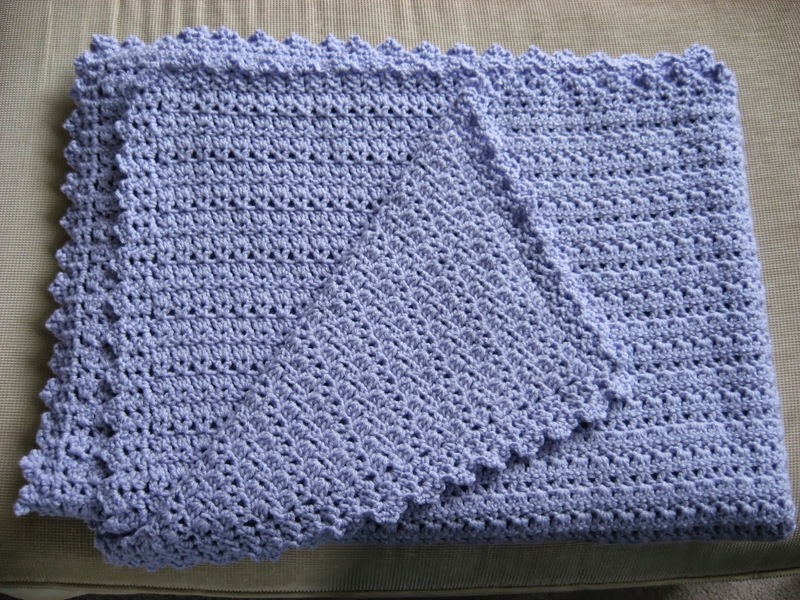 Hooked on Needles: Mary's Wedding Gift Afghan ~ Finished and On Its Way! 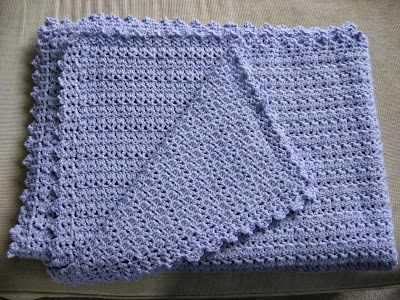 Mary's Wedding Gift Afghan ~ Finished and On Its Way! Mary's Wedding Gift Afghan is finally heading to its new home in Texas! I actually finished it quite a while ago, but with school starting and now a new job, finding time to photograph it and package it up and mail it was proving difficult. 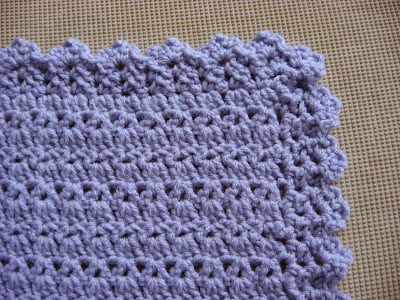 This afghan was crocheted using THIS pattern from the Red Heart website and Bernat's Waverly yarn in Thistle, which is actually a pale lavendar color, although I think it shows up more blue on the computer screen. Well, on mine anyway. The border on this afghan turned out so pretty, and it complements the afghan design so nicely. I just love it! Here are a couple more close up shots of that pretty border! 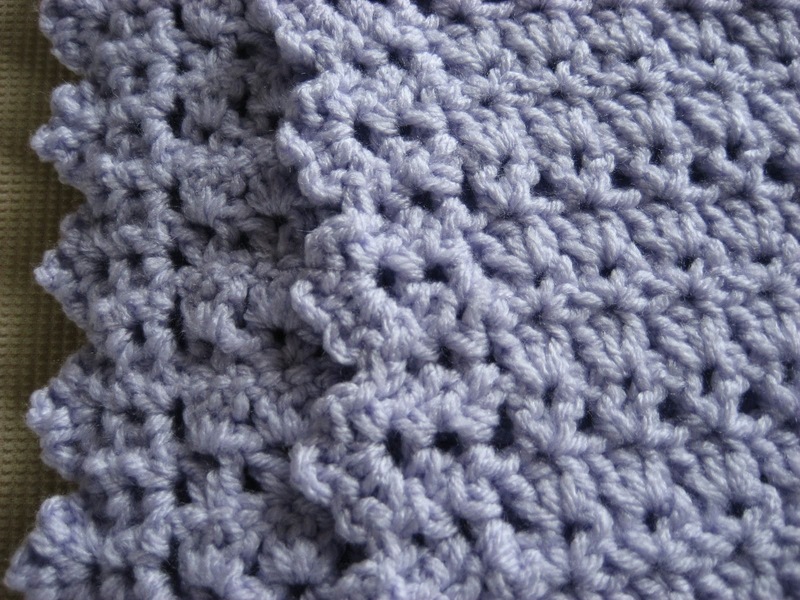 Usually for the border of a crocheted afghan, I would just do a few rounds of single crochet and maybe a round of reverse single crochet (also called crab stitch), or maybe even a simple scallop. For some afghans, I have actually just done one round of single crochet and left it at that so as not to have the border compete with the afghan design, as shown in the last picture on THIS POST of the afghan on our bed. 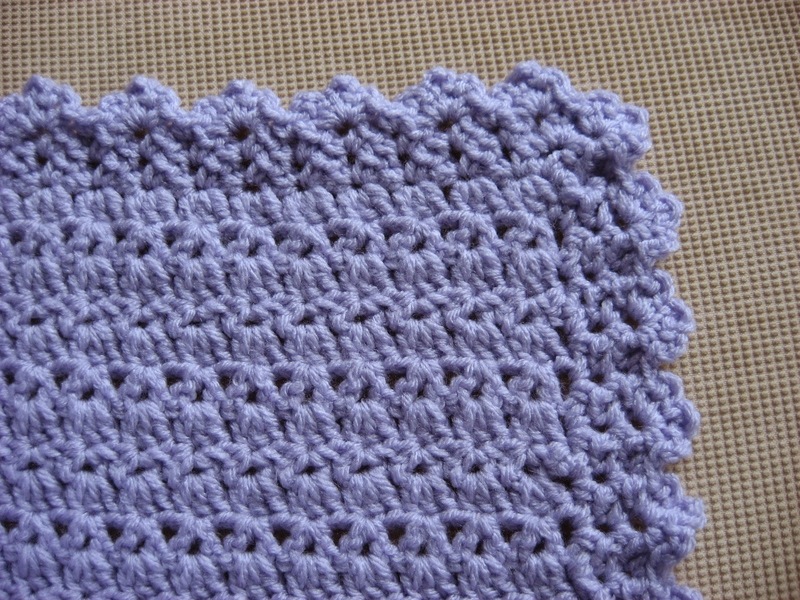 But this border was part of the pattern, and really works so beautifully with this afghan pattern and finishes it off just perfectly. It's very "Mary" too, so girly and feminine! So that's one of my recent finishes. 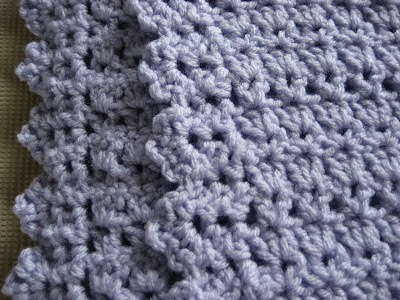 If you are looking for a nice afghan pattern to crochet, this one was very easy to do once the four-row pattern was established. It would be pretty in multiple colors too, maybe changing colors after every pattern repeat. For all you new crocheters out there, this might be a good one to try if you are feeling adventurous and want to step out of your comfort zone. Soon I'll have a fun fall tote bag to show you which will be available for purchase in my Etsy shop. 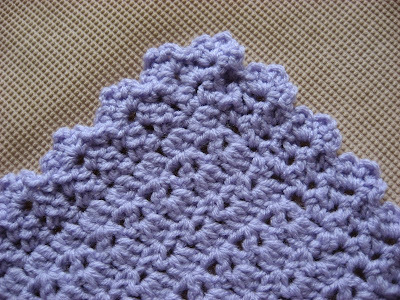 The crochet project I am working on right now is the surprise I've mentioned that I can't show you, so that will have to wait a while to be revealed. I'm pretty sure you are not too interested in seeing some of the other things that have taken up my time recently, like close up pictures of the nervous system, the endocrine system and the reproductive system! We'll just stick with fun, crafty, needlework kind of stuff for now! You're very welcome!